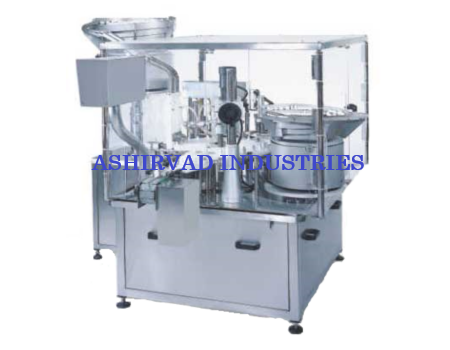 Filling, Inner Cap Placement & Capping Unit is completely in corporate in single body Structure. Pneumatic System for Inner Cap Placement. Mechanical Orientation type Bowl & Chute for Screw Cap Placement. No vial, No Stoppers, No Filling System. Minimum change over time, from one size to another container. Very high accuracy of + 1% in single dose. Production Speed 40 to 80 Vials / min. (Depending upon size of vials). Machine Dimensions 1828 mm (L) X 1220 mm (W) X1220 mm (H). Filling Volume 1 ml. 50 ml. Air consumption 6 to 8 kg, 10 CFM AIR (CLIENT SCOPE). Vacuum Require 150LPM (CLIENT SCOPE). Input (Container Dia/ Height) 16mm Dia to 50mm Dia / Height 75mm Max. Cap Dia 20mm, 25mm 28mm.